An interview with ON Megumi Akiyoshi. 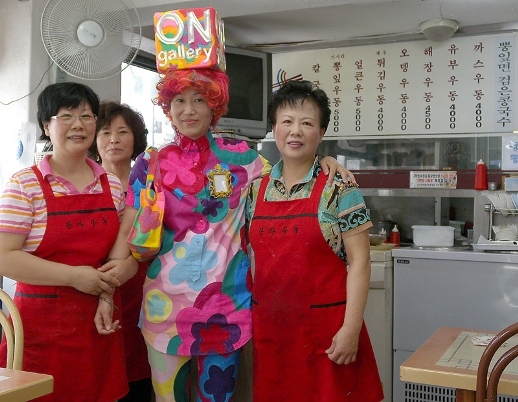 ON is an artist who is anything but typically Japanese. She is assertive, confident and opinionated. ON has lived in New York City for over ten years while maintaining an active career in Tokyo. She has participated in the annual “Sustainable Art” exhibition since 2007 and last year made a piece titled ‘Flower Vegetables’, which drew an uncommon link between art and agriculture. The work displayed a vital connection between artist-run exhibitions and community-supported agriculture across the world. Her works are most often site-specific pieces that come about in an organic manner. I sat down with her the week of the opening for this year’s exhibition, “Threshold: Sustainable Art”, at a café near the Ueno Town Museum. What are you doing in Tokyo now? I am here to do a window painting in a closed elementary school that is used as an exhibition site and an office for a local community center. Tell me more about this exhibition. It is organized by Taito Ward and Tokyo University of the Arts in order to stimulate the community with art. The organization is using closed elementary schools as part of a larger project. Their aim is to let art step outside of art boxes such as museums and galleries. What does “Sustainable Art” mean to you? Sustainability is a term generally used for environmental issues around the world but for this organization sustainable art means continuous activity. Well, maybe environmental awareness combined with continuous actions. There are lots of challenges when exhibiting outside of art boxes; it requires lots of communication with the people in charge of local sites. That is education for both artists and those who accept the proposals. People are not used to accepting art on the street, on their wall, or in a temple or wherever so they have to get used to it. Artists have to learn to negotiate and be persistent. It’s a learning process for both sides. People don’t change in one second. It takes time to change minds and that’s why it needs to continue, it’s not just once. When did you come to be called ON and why? My real name is Megumi Akiyoshi. My parents used a rare Chinese character for my first name. The meaning of Megumi is “blessing”, not like “on” and “off” in English. My parents used a unique character usually read as ON instead of using typical Kanji for a common name, Megumi. The first person to call me ON was my elementary school teacher. The first day of class he wanted to call my name. He said “Akiyoshi…” and then he couldn’t read the next character so he said “ON? But ON is not a name, what is wrong with you?” Other students told him my name is Megumi, and he said it’s not Megumi it’s ON, so he started calling me ON Megumi or O-Megumi. Then he started calling me ON-chan and then people started calling me ON-chan. How did you start the ON Gallery? I was sitting on the subway in New York and I saw a Chinese lady with some toys. She was walking and trying to sell them, “One Dollar…One Dolla.” I thought, I want to do something like that! But I can’t just copy her. Since I’m an artist I should sell art or something, for cheap. Also I had been hearing from all my close friends that they want to buy some original art but it’s too expensive. So I thought, what if I put paintings on me like a moving gallery, like the Chinese lady in the subway. That would be great! I had a sketchbook with me so I drew it right away — a box on my head that said ON gallery. 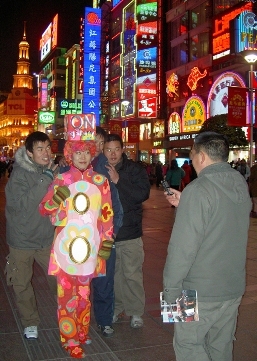 Now you have done ON gallery performances in many cities: Shanghai, Dubai, New York and Tokyo. You mentioned to me last year that Tokyo was the scariest city for you to do the performance, why was that? I grew up in Tokyo so I know how people are shy, scared and don’t want to be involved in weird stuff here. I myself was really like that when I was in Tokyo so I know if I see something like that I try to ignore it as well. So I thought people in Tokyo would be the most cold. Also, when I do it in New York I am a foreigner so I don’t understand what people are talking about. Or at least I can pretend I don’t understand so it is very easy to shut out a foreign language in my head. But in Tokyo I can understand every single thing they are talking about so I cannot be ignorant. I thought I would be more sensitive in Japan and imagined it would be more difficult. As a first step I tried the work at the Echigo-Tsumari Art Triennial in 2003 and that was a little scary, but I really wanted to give it a shot. So I went walking in the rice fields, showing ON Gallery and also looking at other artists’ work at the same time. People were quite friendly and curious. They were talking to me, touching me and a group of people followed me wanting to take pictures. After that I thought maybe I should try this in Tokyo. I remember the first time I saw your work. It was at the opening of the show “Making a Home” at Japan Society in New York. Every surface of your room was glowing with fluorescent painted floral patterns except a single framed painting that was completely white. Why did you hang a single white painting? The white refers to a white wall. If you look really carefully at the surface of the white board inside that gold frame it was really like a conventional wall. Painted with a roller using house paint. It’s just a reversed white wall; the painting is the wall and the wall is the painting. The reason I reversed it is because if you step into a conventional gallery the thing in the frame is usually in the spotlight. I wanted the whole space to be appreciated. Not just the spotlighted area. What would you paint with if you were stuck on a small tropical island with no acrylic paint? It is a very good question since I have been thinking about paints lately. First I would search for vivid stones to grind. Then I would try to find glue from plants or tree resin. If I don’t find anything I would do something…or maybe I wouldn’t do anything. Hmm. What would I do if I just reached an island with no color? I would just take one year to enjoy the place. If we want to keep color in a piece of art forever it is very hard, especially red and pink colors. Those colors are found in nature so maybe we don’t need to create them. The problem is just when we want the piece to remain as a physical work forever. Recently I’ve been researching pigments. There are many natural blue and green pigments that last a really long time. Red and pink are there in nature — they exist on the sky when the sun goes down and on flowers, fruits and vegetables; but they are just temporary. So I would just enjoy the moment. 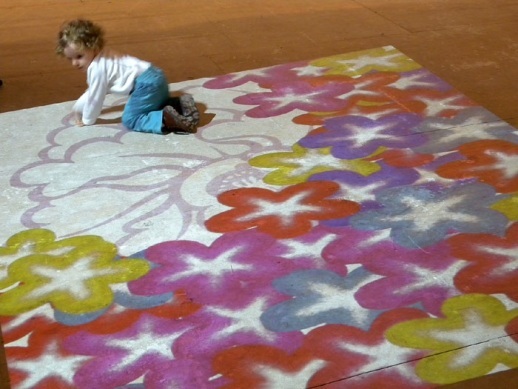 Recently you have been collaborating with the designer of interactive floors for your piece “Blooming Steps” displayed in New York earlier this month. Can you tell me more about how you conceived of this work? 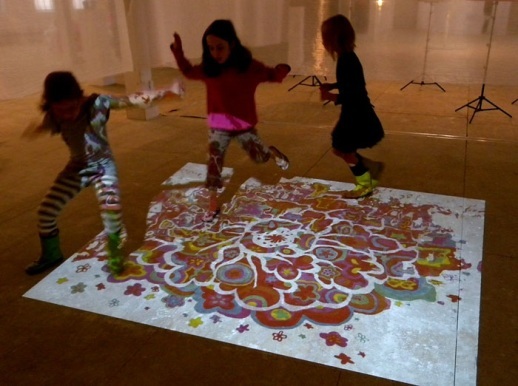 Have interactive works always been a part of your creative practice? I always like to see peoples’ faces light up. I just like to look at them; they are part of something, an amusement park kind of thing. In the flower gallery it’s like people become bees. Each time I do a flower gallery the whole picture outside the frame is like one huge flower bud so people coming into the space are like bees. From my perspective they are part of the piece. If you could do anything in the world for your next show what would it be? My dream is to paint the entire inside of a toilet. Not a bathroom. I don’t care about the bathroom with a bathtub because it’s moist, just the toilet room! In Japan the toilet is separate from the bathtub. It is a sacred space where you can be alone. You can read books. A lot of people have newspapers and magazines in there. They enjoy their aloneness. I want to paint inside the toilet — the whole ceiling, walls and everything. I want to make the toilet like a pistil and stamen design everywhere. “Threshold: Sustainable Art” runs October 19 to November 7 at Ueno Town art Museum.